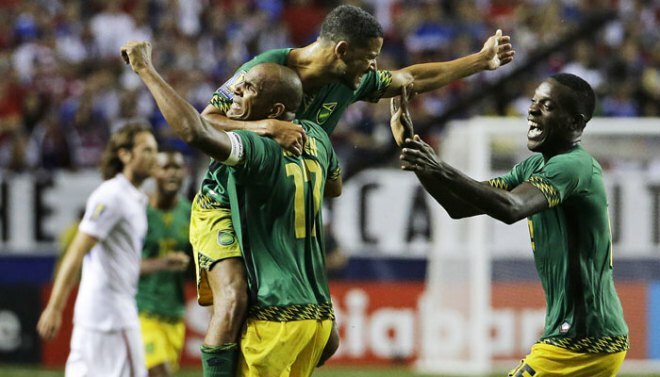 Jamaica`s “Reggae Boyz” stunned defending champion United States 2-1 Wednesday in a Gold Cup semi-final, becoming the first Caribbean squad to reach the final by shocking the heavily favored hosts, AFP reports. Jamaica`s “Reggae Boyz” stunned defending champion United States 2-1 Wednesday in a Gold Cup semi-final, becoming the first Caribbean squad to reach the final by shocking the heavily favored hosts. Darren Mattocks headed in the first goal in the 31st minute and Giles Barnes netted a free kick in the 36th minute to put Jamaica ahead 2-0 and signal an epic upset was in the making at the sold-out Georgia Dome. The Americans, after all, were 13-1 with eight drawn in prior matches against the Jamaicans, their only loss in that span coming by 2-1 at Kingston in 2012.